Learn how to create LUMINOUS, GLOWING, deeply 3-dimensional shading over black tiles! Trouble getting it here? EU or UK resident? Using my unique Glow on the Dark technique, you will learn how to fall in love with black tiles all over again! Black tiles were always so under-appreciated, but not anymore! Eni.....for the past hour, I've been studying your book and practicing and I just LOVE this technique!!! I've been doing Zentangle for several years, but I always felt that the black tiles got the least amount of attention and I wasn't quite sure how to give 'em some love. You've done it! I am so impressed with how you are using the markers to help with the shading. You're brilliant!!! I can't wait to show this to my class tonight!!! I no longer "fear going into the dark" with black tiles... Your black tiles ‘shading techniques’ are a huge hit!!! I’ve been teaching classes for a good while now and each time I taught the ‘black tiles’ class, I just couldn’t get excited about it and that bothered me. In fact, some of my students even told me that doing the black tiles was their least favorite. However, that has changed the other night. After reviewing your book and practicing all afternoon, I was so excited to get to my class and share what you’ve taught. The class LOVED doing the tiles and they did a fantastic job! I was able to keep my enthusiasm alive because I knew I now had something really cool to teach them! I am so used to most of my students loving the ‘renaissance tiles’ the best, but after my class the other night, a couple of them said, “Ya know - I think I like doing these black tiles the best.” That is because of what you taught in your book. In the class, we used the gray markers and they worked great! Plus...we also used some color pencils for the effects with the colors. Those turned out great! Gosh...it's hard to pick a part that was hard because they just breezed thru the process without any difficulty. (thanks to your detailed techniques) Again...thank you from the bottom of my heart! You've made my teaching experience and personal Zentangle experience so much better and it was already pretty darn good! Make sure to get the ebook before purchasing any materials. A complete material's list is described in the ebook, with all the details! If you plan to print this ebook for your own use, keep in mind that this is a VERY detailed book with lots of pictures, prepare your ink cartridge accordingly. Note: at the back of the book you will find two "Cheat Sheet" pages, with summaries of the technique -- in case you prefer to not print the entire book! I got mine! I also picked up your Shading with Gray Markers Ebook! I love your books! Thanks for the e-book on black glow in the dark tiles. Your books make is easier to learn & teach classes. I'm looking forward to getting started again with black tiles. Thanks for the help. And the fabulous book. I've been drooling over it ever since you posted your first couple of glowing tiles. It does not disappoint! You've created a beautiful technique for the black tiles! Thank you for sharing your gifts and talents with us. This technique will change that forever! 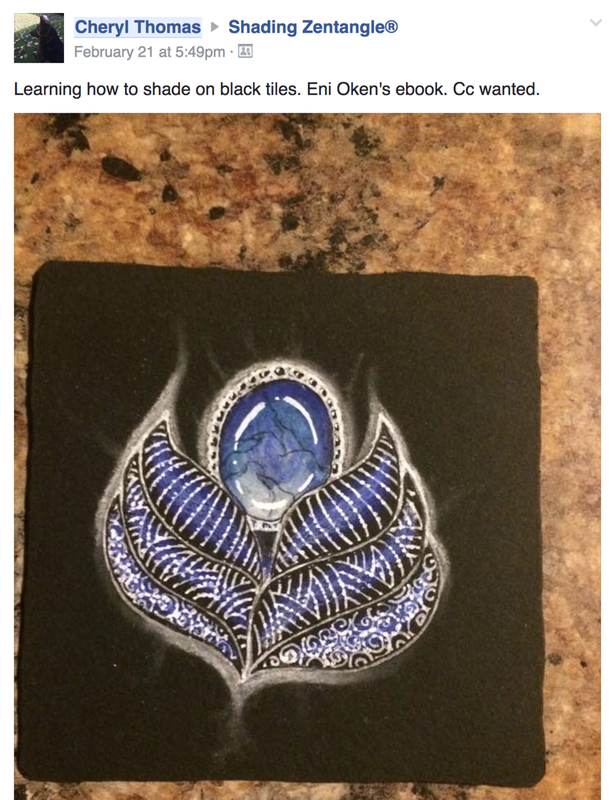 The Black Tile class will be one of your favorites, after you've tried my Glow on the Dark technique. I have been playing a bit with this fantastic new and fun technique from Eni (thanks for the book Eni - I love it! <3 )and here is my first attempt on a tile. Love your art and books! NEW EBOOK: Glow on the Dark! 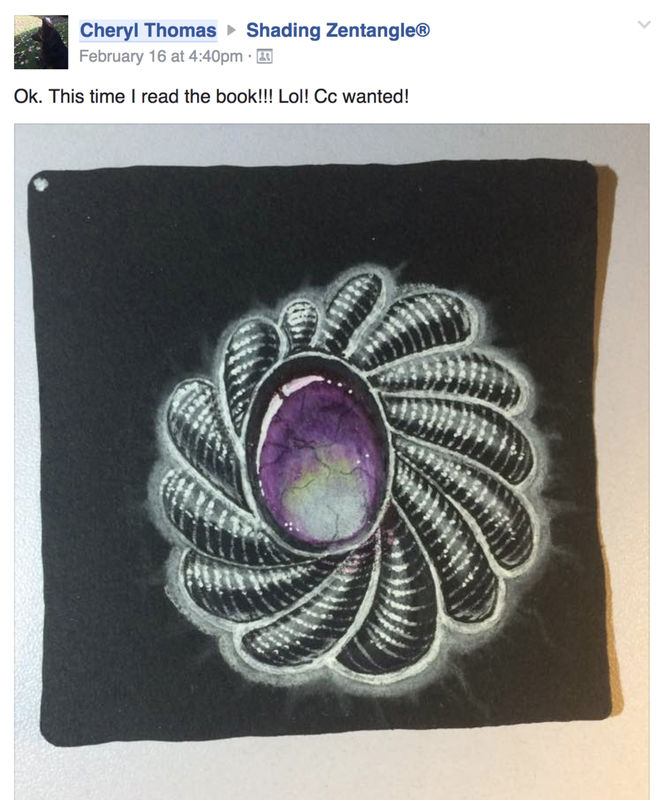 Zentangle: Live class or books?